Luminously fractured melodies, delicate chords voiced just so, graceful interplay between piano and electronics, thickets of sound giving way to fleeting moments of clarity and repose — a repose that never lasts long as there’s always something unsettled pushing the movement forward! 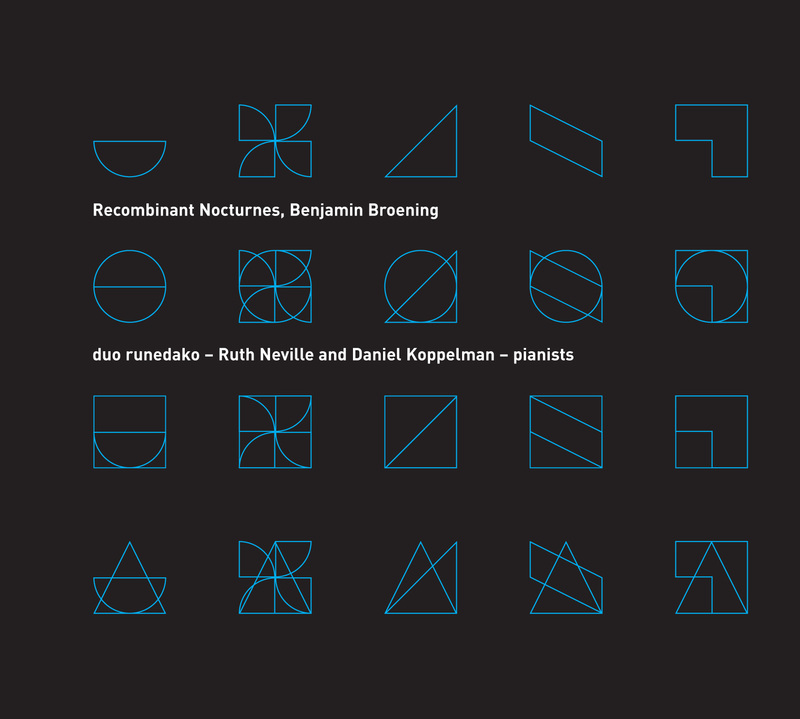 These are the powerful experiences of Recombinant Nocturnes, the most recent product of a long-standing musical collaboration between composer Benjamin Broening and pianist Daniel Koppelman, which has led to numerous premieres and performances at such far-flung venues as the International Computer Music Conference in Miami; Two Days and Two Nights of New Music in Odessa, Ukraine; and the Krakow Academy of Music. Expertly performed by the virtuoso duo runedako (Ruth Neville and Daniel Koppelman) the six works on this disc (for various permutations of one or two players on one, two, or four pianos, with and without electronics), try to answer the question “When is a repeat not a repeat?” The interconnected pieces all share the same musical DNA: materials, gestures, rhythmic ideas and brief melodic fragments drift from one piece to another in the set, constantly recombining in new ways to create music that ranges from delicate tintinnabulations at the threshold of audibility to passages of explosive virtuosity. From the aphoristic Nocturne Fragments interspersed throughout the disc, to the powerful, monolithic chords evoking Messiaenic ecstasy of Double Nocturne, to the deceptively simple mystery of Night Falls (Nocturne Loops), this contemporary take on the Nocturne unfolds beautifully. But it’s not the only possible ordering. Try playing the disc on shuffle mode and you’ll hear some new and beautiful transitions between movements and pieces, new musical connections too! First Chopin, then Bartok and Carter, now Broening; your night-time soundtrack may never be the same again.